Does anyone besides me get stuck on lunch ideas? We do often have leftovers from the night before, but recently we’ve had some BIG eaters around here and we’ve had enough leftovers for 1… so Brian usually takes that to work for lunch. The kids will often ask for banana boats or Greek yogurt with fresh fruit and granola, but as they get older this isn’t nearly enough to hold them for the afternoon. I’ll often serve some veggies and maybe an apple or something else, but it just isn’t enough to hold them for very long. I really think they need more protein, either left over meat, sandwich meats (EXPENSIVE! ), sausages, hot dogs, or something!!!! I’m working on it, but I’m not super thrilled that it may be a little bit more labor intensive… If you have any ideas, I’d LOVE to hear them! As an aside, my grandmother makes AMAZING deviled eggs. They are always requested for picnics and family gatherings and if you aren’t one of the first people to get food, you probably won’t get one of her eggs. She makes A LOT of them, but it’s never enough. Even though we’ve been eating them since we were kids, we still haven’t overdosed on them and there are always exclamations about how delicious they are! So…. I had an idea… Why not make them for lunch! The kids don’t really like hard boiled eggs because they are too dry for their liking! I usually make two eggs for each of them and add a raw fruit and veggie and it’s perfect! They are easy to make, don’t take a lot of time and it’s usually ingredients I already have on hand. Put the whites on a plate. *all these are estimations since I’ve never measured it. I just mix and taste, mix and taste until it tastes like I want it! I’ve made these quite a few times over the summer and early fall. Obviously not for my family since it is tradition that Mim bring them! Also, I wouldn’t even want to try and fill her shoes. I’m sure the family would find plenty of things I didn’t do right upon making them! 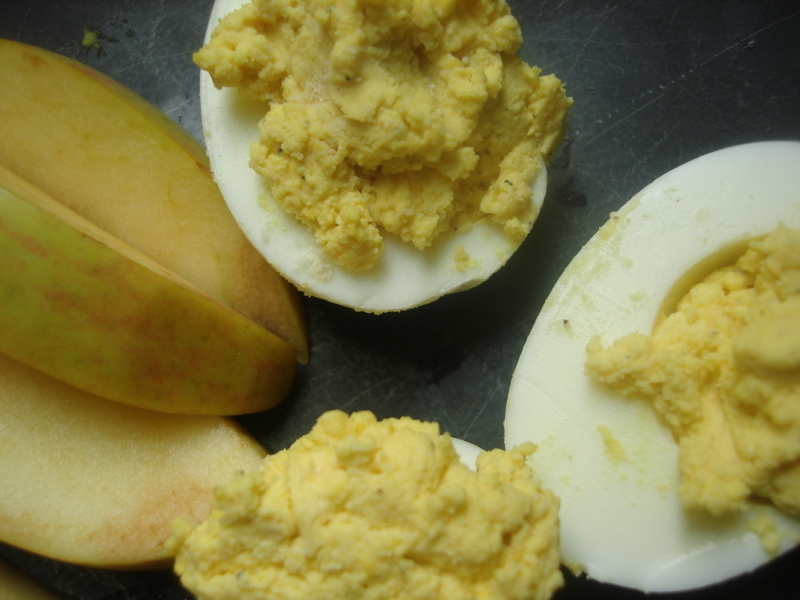 And in their stead… over the years we’ve all become connoisseur of deviled eggs! I’ve tried my hand at them and I feel like they turn out pretty good! I was quite pleased! I’ve taken them to a few church picnics and bible study gatherings that my family wouldn’t attend. They were a hit! I saw one young man eat about 8 of them! Either he was just hungry or they actually tasted ok!